Welcome to my new series which follows along a brochure I found at the Southwest Historical Socity. 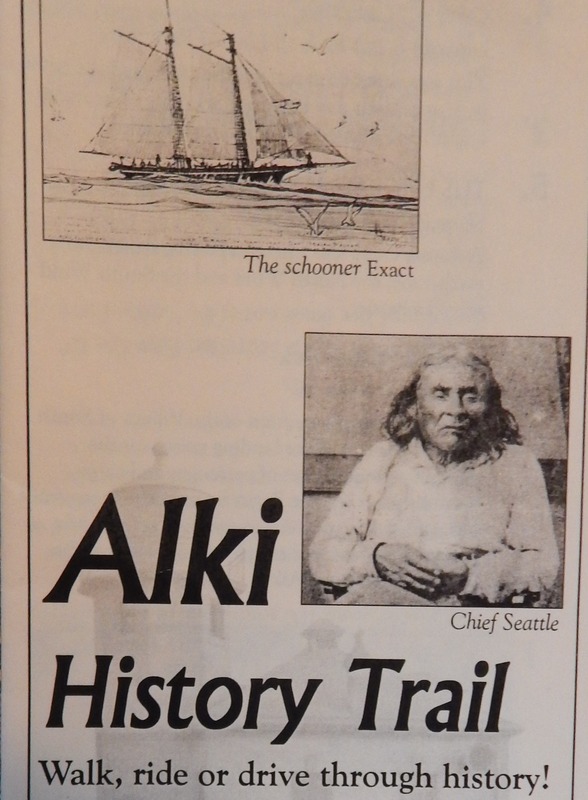 Above is a photo of the front cover with Cheif Sealth (we are named after him) and the schooner Exact (it brought the some of the first pioneers to Seattle in November 1851). 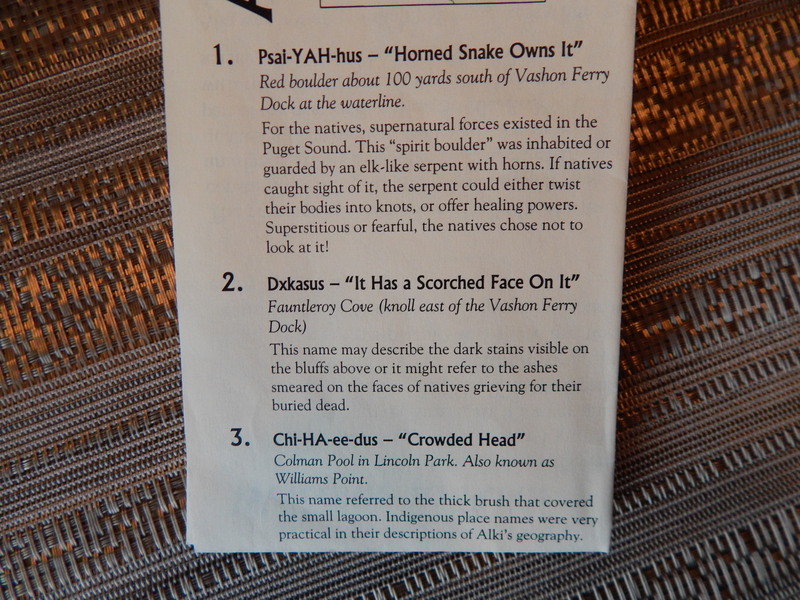 The first stop on the Alki History Trail is called by the local Native Americans “Psal-YAH-hus. I live up the hill from the Ferry Dock, so I parked at Lincoln Park and trekked south. 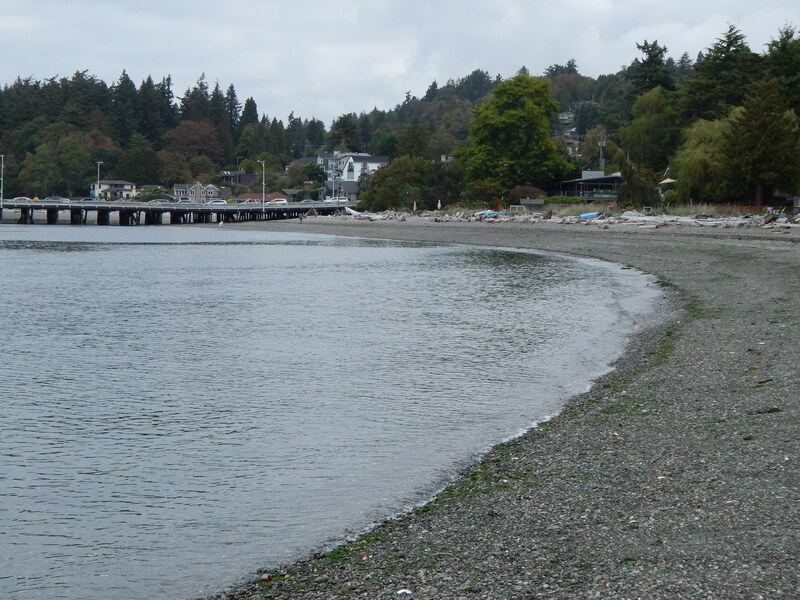 Here is what the guide says I am looking for – Red boulder about 100 yards south of the Vashon Ferry Dock at the waterline. For the natives, supernatural forces existed in the Puget Sound. This “Spirit Boulder” was inhabited or guarded by an elk-like serpent with horns. If natives caught sight of it, the serpent could either twist their bodies into knots, or offer healing powers. Superstitious or fearful, the natives chose not to look at it! Off I went on my brave mission to view the supernatural rock. I walked down the north side of the dock into Cove Park. I figured I could walk under the dock and head south. This part of the beach I need to access is bordered by private homes and that is the easiest access for me. The tide had gone out and was just starting back in. It wasn’t a very low tide and to my disappointment there was no red boulder to be seen. Could it be my guardian spirits protecting me from looking at the “Horned Snake Owns It” and getting twisted up? Site of “Horned Snake Owns It”. Tide not low enough! I returned days later thinking the tide was out far enough but again I left with no picture of the red spirit boulder. That was back in September and early October. Every weekend I have been checking the tides and they are timed so the lowest tides are in the middle of the night. Not a very great way to start my trek but it does lend a bit of mystery to things. 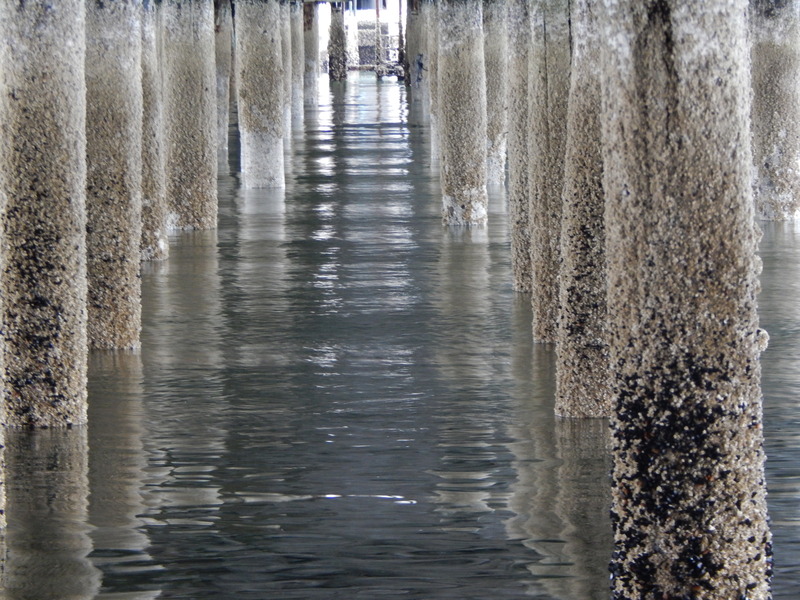 However, on the good side, I did find a flock of crows and got this great shot of underside of the pier. Several of these photos I used in an article on the Fauntleroy Crows and the elusive red boulder.